Imagine if the only films you ever saw consisted of romantic slush. Sure, it’s pleasant enough to watch the odd feel-good rom-com, and the latest slew of indie flicks that employ some hapless, scrawny sucker brimming with a nerdy charm to bring an element of geek-chic to the proceedings are making the genre more bearable to the cynical masses (depending on your level of cynicism of course), but pretty soon you’re going to get sick of all the icky love stuff. Pretty soon you’re going to demand more from your movie. Well, the same goes for your music. Many musicians of the cursed singer-songwriter variety tend to fall back on their own experiences of love. While this is all very nice, in a slushy sort of way, the vast majority seem a little daunted by the prospect of exploring a broader subject matter. Thankfully, Fionn Regan is one troubadour who’s not afraid to push unfamiliar boundaries. While his debut album The End of History matches the enormity of current follow-up Shadow of an Empire in the impressive name stakes, the former stopped short of contextually tackling the unknown the way that this new record seems to. Although The End of History was a fine album full of quietly confident, folksy musicianship, Shadow of an Empire sees Regan’s music mature alongside its creator. Themes such as racketeering, institutionalism, abuse and genocide run strong throughout the album and are largely given an ironic, upbeat melody that draws attention to their blunt, albeit beautifully penned, lyrics. On second single ‘Catacombs’, for example, Regan jauntily sings “Let’s take it outside / the kids are sleeping / I’ll pay you to do me some damage” and on ‘Genocide Matinee’ he thunders through a chorus containing the lyrics “They’re selling coupons / They’re handing out tokens / Now the curtains are shrieking / Take your seats for the genocide matinee” with a raucous, bass-heavy charm that’s not dissimilar to some of The Libertines’ more boisterous numbers. Although Regan has certainly turned up the tempo and given Bob Dylan some company on his list of notable influences (Johnny Cash is right up there beside him), he somehow manages to retain an admirable level of individuality. The beauty of the quieter songs on ‘Shadow of an Empire’ serve to highlight just how talented a musician Fionn Regan is: the wistful imagery of ‘Little Nancy’ uncannily captures a relationship unburdened by the demands of adulthood while the delicate arpeggio and vocal fluctuation of’ Lord Help My Poor Soul’ convey genuine sentiment. Listen to ‘Violent Demeanour’ for a masterclass in fusing true folk-style storytelling with rollicking rock ‘n’ roll. Shadow of an Empire is undoubtedly a triumphant second album for Fionn Regan. It sees him both staying true to the folk sensibilities and off-kilter lyricism that helped him to create such mesmeric songs as ‘Put a Penny in the Slot’ and ‘Hey Rabbit’, whilst simultaneously teetering on the cusp of his comfort zone; both lyrically and musically. A truly refreshing album. One of the UK and Ireland’s loveliest independent music sites, Ragged Words, is turning its attentions to organising gigs. With a talented group of writers who really know their stuff and a starting line-up as good as this one, chances are we’re in for a treat. I’m especially looking forward to sibling duo, The Holy Roman Army, whose debut album ‘How the Light Gets In” was definitely one of the most under-rated of the year. 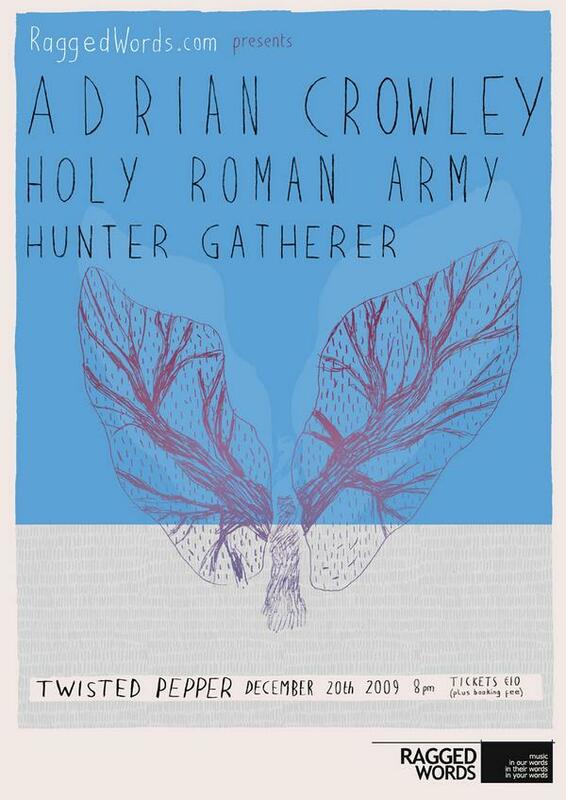 The first of many Ragged Words shows (on both side of the Irish Sea) sees Adrian Crowley, The Holy Roman Army & Hunter-Gatherer play Dublin’s Twister Pepper on Sunday December 20. We’re thrilled to have put together a really strong lineup – all three acts are being strongly tipped for a Choice Music Prize nomination when the shortlist is announced in mid-January – so this gig showcases some of the cream of Irish music doing the rounds right now.